We have worked with the Sanghera Rum Company to design and name Five Rivers, their finest Indian small batch white rum which has been produced by the family for over 150 years. The word Punjab means ‘land of five waters’ and is where the Sanghera family rum gets its name. 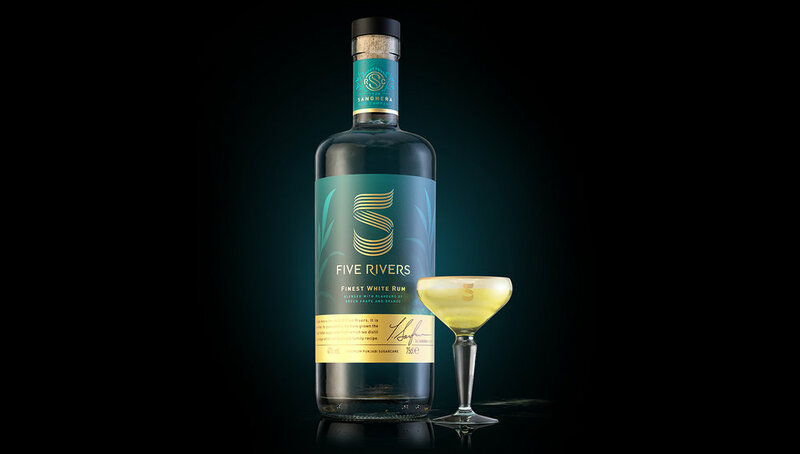 Five Rivers is a rich, elegant and captivating premium white rum. Its story starts high up in the foothills of the Himalaya, the source of the Five Rivers. It is from here that these great rivers begin their journey. They travel down the plains of the Punjab enriching the soil and creating the perfect conditions for growing some of the finest sugarcane in the world. From this sugar cane comes Five Rivers Rum. Working in partnership with the Sanghera family, Echo have created the complete brand, from name and visual identity to bottle label design. The hand drawn brand mark is simple, bold and symbolic. It is a visual representation of the five rivers joining harmoniously together as a symbol of the Punjab. The family crest has been designed to reflect the sugar cane and original Sanghera family home nestled within the lush green, sugar cane fields. The use of blue colour palette creates a combined sense of richness and freshness, while the gold creates a premium feel, hinting at the golden sunlight over the water. Five Rivers will be available to taste at stand A97 at Imbime Live in London on 3rd and 4th of July.